- Mr. Heavy-Metal, Rock Fujiyama, and [[Jukebox Hero|Jukebox English]]. + Heavy Metal-san (ヘビメタさん, ''Hebimeta-san''), Rock Fujiyama (ロックフジヤマ, ''Rokku Fujiyama''), and [[Jukebox Hero|Jukebox English School]](ジュークボックス英会話, ''Juukubokkusu Eikaiwa''). - Friedman is a largely [[HowTo:Learn_Guitar|self-taught guitarist]], with no formal training in [[Music Theory|music theory]]<ref>[http://www.youtube.com/watch?v=uSaTAGsIBEI I am scales and so can you!]</ref>. Despite this, he is esteemed for his improvisational skills and his unique ability to fuse a wide variety of unorthodox [[world music]] styles with metal, which conventionally took its inspirations from Western Classical music, such as that of [[Randy Rhoads|Bach]], [[Paul Gilbert|Haydn]], and [[Yngwie_J._Malmsteen|Paganini]]. On stage, Friedman is known for his energetic, passionate playing style<ref>[http://www.martyfriedman.com/media_galeri_popup.php?id=14 ''Energetic'' and ''passionate'']</ref>. In contrast to the sweep picking of his neo-classical contemporaries and the alternate picking method favored in thrash, Friedman uses a unique picking style which favors up-strokes. Friedman is instantly recognizable for his vast arsenal of exotic scales, though he says he never studied scales and plays everything by ear<ref>"The misconception about me is that I know technical stuff." -[http://www.guitarsite.com/newsletters/990621/9.shtml Marty]</ref>. + Friedman is a largely [[HowTo:Learn_Guitar|self-taught guitarist]], with no formal training in [[Music Theory|music theory]]<ref>[http://www.youtube.com/watch?v=uSaTAGsIBEI I am scales and so can you!]</ref>. Despite this, he is esteemed for his improvisational skills and his unique ability to fuse a wide variety of unorthodox [[world music]] styles with metal, which conventionally took its inspirations from Western Classical music, such as that of [[Randy Rhoads|Bach]], [[Paul Gilbert|Haydn]], and [[Yngwie_J._Malmsteen|Paganini]]. On stage, Friedman is known for his energetic, passionate playing style<ref>[http://www.martyfriedman.com/media_galeri_popup.php?id=14 ''Energetic'' and ''passionate'']</ref>. In contrast to the sweep picking of his neo-classical contemporaries and the alternate picking method favored in thrash, Friedman uses the picking style traditionally used on a Shamisen (三味線), a banjo-like instrument from Japan. Friedman is instantly recognizable for his vast arsenal of exotic scales, though he says he never studied scales and plays everything by ear<ref>"The misconception about me is that I know technical stuff." -[http://www.guitarsite.com/newsletters/990621/9.shtml Marty]</ref>. While in high school, Friedman teamed up with Tom Gattis to form the band '''[[Deuce Deuce|Deuce]]''', which played music inspired by [[KISS]], [[Geddy Lee|Rush]], [[The Ramones]], and [[Box of Scorpions|The Scorpions]]<ref>[http://www.gattismetal.com/guys/tom/index.htm Yes, SCORPIONS]</ref>. In 1982, Friedman formed the band '''[[Kitsune|Vixen]]''', which put out an album before realizing "Vixen" is a girl band name. The band reformed as '''[[Hawaii]]''' and put out three more albums before it broke up in 1985<ref>From the bastions, in the deepest fathoms of the sea, came spewing forth in a cloud of volcanic ash and raining fire, a structure of molten rock forming [http://eds.org/~dan/images/hawaii.jpg ''ONE NATION UNDERGROUND]</ref>. While in high school, Friedman teamed up with Tom Gattis to form the band '''[[Deuce Deuce|Deuce]]''', which played music inspired by [[KISS]], [[Geddy Lee|Rush]], [[The Ramones]], and [[Box of Scorpions|The Scorpions]]<ref>[http://www.gattismetal.com/guys/tom/index.htm Yes, SCORPIONS]</ref>. In 1982, Friedman formed the band '''[[Kitsune|Vixen]]''', which put out an album before realizing "Vixen" is a girl band name. The band reformed as '''[[Hawaii]]''' and put out three more albums before it broke up in 1985<ref>From the bastions, in the deepest fathoms of the sea, came spewing forth in a cloud of volcanic ash and raining fire, a structure of molten rock forming [http://eds.org/~dan/images/hawaii.jpg ''ONE NATION UNDERGROUND]</ref>. - In 1986, Friedman was approached by '''[[Lou Gehrig's Disease|Jason Becker]]''', a young guitar prodigy in search of a new teacher. Together, they formed the band '''[[Guitar Duel|Cacophony]]''', renowned for its technically challenging, complexly harmonized guitar solos (duets) and ridiculous lyrics. Cacophony put out two albums, ''Speed Metal Symphony'' and ''Go Off! '', and toured the United States and Japan, before Friedman and Becker went their separate ways in 1989<ref>[http://megadeth.rockmetal.art.pl/ articles_metalattack1990.html There were fears that this talented virtuoso would land in a pop rock band wasting his talent.]</ref>. + In 1986, Friedman was approached by '''[[Lou Gehrig's Disease|Jason Becker]]''', a young guitar prodigy in search of a new teacher. Together, they formed the band '''[[Guitar Duel|Cacophony]]''', renowned for its technically challenging, complexly harmonized guitar solos (duets) and ridiculous lyrics. Cacophony put out two albums, ''Speed Metal Symphony'' and ''Go Off! '', and toured the United States and Japan, before Friedman and Becker went their separate ways in 1989<ref>[http://megadeth.rockmetal.art.pl/ articles_metalattack1990.html There were fears that this talented virtuoso would land in a pop rock band wasting his talent.]</ref>. The Japan tour was especially fun for Marty, who had a growing interest in Japanese music and Visual Kei, especially the band [[hide|X Japan]]. ''[[Recipes on Endangered Species|Countdown to Extinction]]'', Megadeth's 1992 album, was a stylistic departure from the band's previous releases. While still driven by fast technical riffs, the songs were shorter and more [[sold out|radio-friendly]]. 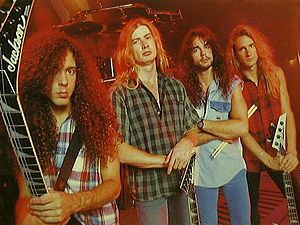 The change was motivated by trends in thrash metal at the time, Mustaine's desire to reach a wider audience, and Friedman's love of popular rock music. The move paid off and the album was Megadeth's most successful release<!--<ref>What, did you expect me to justify this with record sales or something?</ref>-->. The trend continuted with ''[[Euthanasia|Youthanasia]]'', the band's 1994 album. ''[[Recipes on Endangered Species|Countdown to Extinction]]'', Megadeth's 1992 album, was a stylistic departure from the band's previous releases. While still driven by fast technical riffs, the songs were shorter and more [[sold out|radio-friendly]]. The change was motivated by trends in thrash metal at the time, Mustaine's desire to reach a wider audience, and Friedman's love of popular rock music. The move paid off and the album was Megadeth's most successful release<!--<ref>What, did you expect me to justify this with record sales or something?</ref>-->. The trend continuted with ''[[Euthanasia|Youthanasia]]'', the band's 1994 album. - The late 90s saw Megadeth complete its transformation from thrash metal to [[Music_radio#Rock|mainstream radio rock]]. ''[[Worst 100 Cryptic Crossword Clues of All Time|Cryptic Writings]]'' (1996) and ''[[HowTo:Catch A Mouse#Buy A Cat|Risk]]'' (1999) together produced six top 20 singles, inclusing Megadeth's first #1 hit song, ''[[The Useless Idiot's Guide to Girlfriends|Trust]]''<!--<ref>BLAHBLAHBLAH</ref>-->. However, Mustaine began to feel pressure from [[Metalheads|long-time fans]] to return to the band's former thrash sound. He informed the band of his decision during the Risk tour, and Friedman, who prefered the Hard Rock sound, left the band<ref>"Remember the reason that Marty is not in Megadeth anymore: he wanted to be in a pop band with a female singer in Japan. He quit." - [http://www.roadrunnerrecords.com/blabbermouth.net /news.aspx?mode=Article&newsitemID=19177 Dave Mustaine]</ref>. + The late 90s saw Megadeth complete its transformation from thrash metal to [[Music_radio#Rock|mainstream radio rock]]. ''[[Worst 100 Cryptic Crossword Clues of All Time|Cryptic Writings]]'' (1996) and ''[[HowTo:Catch A Mouse#Buy A Cat|Risk]]'' (1999) together produced six top 20 singles, inclusing Megadeth's first #1 hit song, ''[[The Useless Idiot's Guide to Girlfriends|Trust]]''<!--<ref>BLAHBLAHBLAH</ref>-->. However, Mustaine began to feel pressure from [[Metalheads|long-time fans]] to return to the band's former thrash sound. He informed the band of his decision during the Risk tour, and Friedman, who felt the band should only move forward, left the band<ref>"Remember the reason that Marty is not in Megadeth anymore: he wanted to be in a pop band with a female singer in Japan. He quit." - [http://www.roadrunnerrecords.com/blabbermouth.net /news.aspx?mode=Article&newsitemID=19177 Dave Mustaine]</ref>. While Friedman was in Megadeth, the band sold a total of over ten million albums worldwide<ref>But would you trust a [http://www.celebrityrockstarguitars.com/rock/friedman.htm source] that lists his fifth solo album as his debut?</ref>. While Friedman was in Megadeth, the band sold a total of over ten million albums worldwide<ref>But would you trust a [http://www.celebrityrockstarguitars.com/rock/friedman.htm source] that lists his fifth solo album as his debut?</ref>. - Friedman joined the backing band for j-pop idol Nanase Aikawa in 2005. He plays on her album ''R.U.O.K?!'' and continues to tour with her. He also regularly tours with other Japanese musicians, including Ami Suzuki and Nana Kitade. + In 2004, Marty joined forces with Matsuura "TAKEOMI" Takeomi (松浦 "TAKEOMI" 武臣) to form ZETA, a group that combined [[Trance|psytrance]] with rock guitar. Together, they performed many live shows around Japan, and in 2007, released their self-titled album, Zeta. + In 2005, Marty joined the backing band for j-rock starlet Aikawa Nanase (相川 七瀬). The band also featured Guitarist PATA of [[X Japan]], and drummer Shinya of [[Missions to the Moon|Luna Sea]]. Together, they recorded and toured in support of the ''[[Ok|R.U.O.K?!]]'' EP. Marty continutes to work with Nanase. She is currently in the studio working on a new album. + In 2005, Marty toured with former PIERROT vocalist KIRITO (キリト). Also supporting KIRITO on this tour was bassist Mick Karn, of [[Japan]] (the band, not the country.) Both KIRITO and Karn would later go on to contribute to Marty's album ''Loudspeaker''. + In 2005, Marty joined [[Suzuki Method|Suzuki Ami]] (鈴木 亜美) for her tour in support of her album ''[[Ferdinand Magellan|Around the World]]''. Their live performance can be seen on the DVD [http://www.amazon.co.jp /SUZUKI-AROUND-WORLD~ LIVE-HOUSE-2005~/dp/B000CQM07S/ref=sr_1_2?ie=UTF8 &s=gateway&qid=1200784717&sr=8-2 SUZUKI AMI AROUND THE WORLD~LIVE HOUSE TOUR 2005~] . + In 2006, Marty, with vocalist and lyricist Clair (クレア), composed and recorded an ending theme song for the show ''[[Megaman ZX|Rockman.EXE Beast]]'' (ロックマン エグゼ BEAST) (known in the US as ''MegaMan NT Warrior BEAST''). Clair is really cool and worked with [[Jackie Chan]] on [[Minesweeper|landmine]] reform. + In early 2007, Marty colaborated with j-pop artist KOTOKO (ことこ) on the single ''Kirei na Senritsu''. Marty wrote the music and played guitar on the track. The song is the new ending theme for the [[Kawaii|shōjo]] anime [[Lesbian|Maria-sama ga Miteru]] ([[Finding Christian Symbology in Pokémon|マリア様がみてる]]), by mangaka Konno Oyuki (今野 緒雪), who also wrote the song's lyrics. The song will appear on the ''Maria-sama ga Miteru 3rd Season OVA Soundtrack'' (マリア様がみてる3rdシーズンOVA サウンドトラック). + In 2007, Marty went to work on Kitade Nana's (北出 菜奈's) album ''[[pie|BERRY BERRY SINGLES]]''. The album is a collection of Nana's hit singles, but also features a few new tracks, which Marty produced in addition to playing guitar on. + Marty guest stars on the late night variety / cooking show Chubaw Desuyo. + In 2005, Friedman co-hosted the show "'''Heavy Metal-san'''" alongside [[Metaporn|gravure idol]] Kumada Yōko (熊田曜子), Ayugai Ken (鮎貝健), and Hisatake Yorimasa (久武頼正). The show, a music variety show that aired at 25:00 Tuesday nights, featured actors and models talking about music, and guest musicians (including foreigners touring Japan) who would be pitted against the hosts in metal-centric games. Marty was originally the first episode's guest star, but after the producers saw his [[Anime|chemistry]] with the other hosts and his [[Captain Charisma|popularity]] with the viewers, he was asked to stay on. + The show was astonishingly successful, and after the show's original six-month contract was up, the station decided to revive the show in a form that could represent a wider variety of music and run for longer. This new show, "'''ROCK FUJIYAMA'''", was a more colorful, more upbeat version of its predecessor, and featured, in addition to the old hosts, guitarist Rolly Teranishi. Notable guests on the show include [[Paul Gilbert]], [[Slayer|Kerry King]], [[PARTY HARD|Andrew W. K.]], [[Dragonforce]]<!--I am TOTALLY aware that this is a CVP link. Leave it.-->, The [[Crusades|BEAT CRUSADERS]], and Aikawa Nanase. + * '''[[Engrish|Jukebox Eikaiwa]]''' - Marty translates English lyrics so people can understand them. + * '''[[American Idol|*Uta Sta! *]]''' - Regular people compete to become Japan's next big idol. Marty is on the panel of judges. + And he is featured in advertising campaigns for '''[[Mitsubishi]]''', [[cell phone]] company '''AU''', beverage company '''[[Why? :Water is good for our health?|Suntory]]''', and the '''[[Metal#Metal (Mineral)|Japan Iron and Steel Federation]]''' (because he is associated with metal). - In addition to his own shows, Marty makes regular guest appearances on Japanese television. He's built up a TV personality where he acts as a "[[Wapanese|crazy gaijin]]" who thinks he's Japanese, while the country [[The "No Gaijin Allowed"'s of Japan|humors him]] because he is so good at guitar. According to Friedman, "In Japan, so many more people know [him] from [his] television appearances than from [his] music career that it’s not even funny. It’s all good, though, because the exposure is getting [his] music into the mainstream. "<ref>In [http://www.guitarplayer.com/article/marty-friedman/jul-07/29344 the same interview], he calls the Ibanez MFM-1 (the shiny blue one with the stars) a "manly guitar".</ref> Friedman also recently landed a role in a major Japanese film titled '''[[Kitten Huffing|Guuguudatte Neko Dearu]]'''. + Marty has also been cast in the upcoming film '''グーグーだって猫である''' (which means "[[Kitten Huffing|because the cat snores]]") alongside Koizumi Kyôko (小泉今日子), Ueno Juri (上野樹里), Kase Ryō (加瀬亮), Matsubara Chieko (松原智恵子), and Hayashi Naojirou (林直次郎). Marty Friedman (born Martin Adam Friedman, on December 8, 1962) is a Jewish-American guitarist best known as the lead guitarist for the thrash metal band Megadeth from 1990 to 1999. He now resides in Japan, where he hosts a number of TV shows, including Heavy Metal-san (ヘビメタさん, Hebimeta-san), Rock Fujiyama (ロックフジヤマ, Rokku Fujiyama), and Jukebox English School(ジュークボックス英会話, Juukubokkusu Eikaiwa). Friedman is a largely self-taught guitarist, with no formal training in music theory. Despite this, he is esteemed for his improvisational skills and his unique ability to fuse a wide variety of unorthodox world music styles with metal, which conventionally took its inspirations from Western Classical music, such as that of Bach, Haydn, and Paganini. On stage, Friedman is known for his energetic, passionate playing style. In contrast to the sweep picking of his neo-classical contemporaries and the alternate picking method favored in thrash, Friedman uses the picking style traditionally used on a Shamisen (三味線), a banjo-like instrument from Japan. Friedman is instantly recognizable for his vast arsenal of exotic scales, though he says he never studied scales and plays everything by ear. 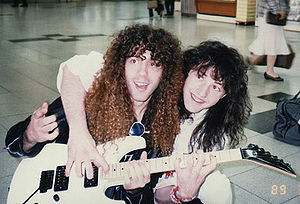 Marty Friedman and Jason Becker during Cacophony's Japan Tour, in 1989. In 1986, Friedman was approached by Jason Becker, a young guitar prodigy in search of a new teacher. Together, they formed the band Cacophony, renowned for its technically challenging, complexly harmonized guitar solos (duets) and ridiculous lyrics. Cacophony put out two albums, Speed Metal Symphony and Go Off!, and toured the United States and Japan, before Friedman and Becker went their separate ways in 1989. The Japan tour was especially fun for Marty, who had a growing interest in Japanese music and Visual Kei, especially the band X Japan. The late 90s saw Megadeth complete its transformation from thrash metal to mainstream radio rock. Cryptic Writings (1996) and Risk (1999) together produced six top 20 singles, inclusing Megadeth's first #1 hit song, Trust. However, Mustaine began to feel pressure from long-time fans to return to the band's former thrash sound. He informed the band of his decision during the Risk tour, and Friedman, who felt the band should only move forward, left the band. In 2004, Marty joined forces with Matsuura "TAKEOMI" Takeomi (松浦 "TAKEOMI" 武臣) to form ZETA, a group that combined psytrance with rock guitar. Together, they performed many live shows around Japan, and in 2007, released their self-titled album, Zeta. In 2005, Marty joined the backing band for j-rock starlet Aikawa Nanase (相川 七瀬). The band also featured Guitarist PATA of X Japan, and drummer Shinya of Luna Sea. Together, they recorded and toured in support of the R.U.O.K?! EP. Marty continutes to work with Nanase. She is currently in the studio working on a new album. In 2005, Marty toured with former PIERROT vocalist KIRITO (キリト). Also supporting KIRITO on this tour was bassist Mick Karn, of Japan (the band, not the country.) Both KIRITO and Karn would later go on to contribute to Marty's album Loudspeaker. In 2005, Marty joined Suzuki Ami (鈴木 亜美) for her tour in support of her album Around the World. Their live performance can be seen on the DVD SUZUKI AMI AROUND THE WORLD~LIVE HOUSE TOUR 2005~. In 2006, Marty, with vocalist and lyricist Clair (クレア), composed and recorded an ending theme song for the show Rockman.EXE Beast (ロックマン エグゼ BEAST) (known in the US as MegaMan NT Warrior BEAST). Clair is really cool and worked with Jackie Chan on landmine reform. In early 2007, Marty colaborated with j-pop artist KOTOKO (ことこ) on the single Kirei na Senritsu. Marty wrote the music and played guitar on the track. The song is the new ending theme for the shōjo anime Maria-sama ga Miteru (マリア様がみてる), by mangaka Konno Oyuki (今野 緒雪), who also wrote the song's lyrics. The song will appear on the Maria-sama ga Miteru 3rd Season OVA Soundtrack (マリア様がみてる3rdシーズンOVA サウンドトラック). In 2007, Marty went to work on Kitade Nana's (北出 菜奈's) album BERRY BERRY SINGLES. The album is a collection of Nana's hit singles, but also features a few new tracks, which Marty produced in addition to playing guitar on. Heavy Metal-san means "Mr. Heavy Metal" in English. Marty guest stars on the late night variety / cooking show Chubaw Desuyo. In 2005, Friedman co-hosted the show "Heavy Metal-san" alongside gravure idol Kumada Yōko (熊田曜子), Ayugai Ken (鮎貝健), and Hisatake Yorimasa (久武頼正). The show, a music variety show that aired at 25:00 Tuesday nights, featured actors and models talking about music, and guest musicians (including foreigners touring Japan) who would be pitted against the hosts in metal-centric games. Marty was originally the first episode's guest star, but after the producers saw his chemistry with the other hosts and his popularity with the viewers, he was asked to stay on. The show was astonishingly successful, and after the show's original six-month contract was up, the station decided to revive the show in a form that could represent a wider variety of music and run for longer. This new show, "ROCK FUJIYAMA", was a more colorful, more upbeat version of its predecessor, and featured, in addition to the old hosts, guitarist Rolly Teranishi. Notable guests on the show include Paul Gilbert, Kerry King, Andrew W. K., Dragonforce, The BEAT CRUSADERS, and Aikawa Nanase. Jukebox Eikaiwa - Marty translates English lyrics so people can understand them. *Uta Sta! * - Regular people compete to become Japan's next big idol. Marty is on the panel of judges. And he is featured in advertising campaigns for Mitsubishi, cell phone company AU, beverage company Suntory, and the Japan Iron and Steel Federation (because he is associated with metal). Marty has also been cast in the upcoming film グーグーだって猫である (which means "because the cat snores") alongside Koizumi Kyôko (小泉今日子), Ueno Juri (上野樹里), Kase Ryō (加瀬亮), Matsubara Chieko (松原智恵子), and Hayashi Naojirou (林直次郎).